On each occasion it’s been held (this is the eighth) the Liverpool Biennial of Contemporary Art always tries to have at least one large outdoors installation. 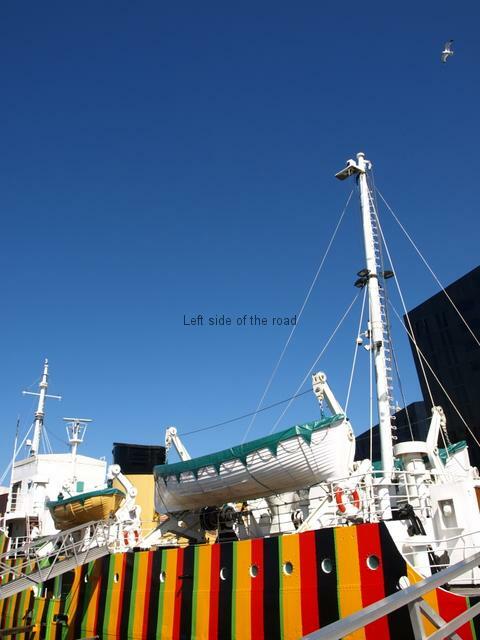 In 2014 this is the so-called ‘Dazzle Ship’, a repainted pilot ship based at the Canning Graving Dock, next to the famous Pierhead on the shores of the River Mersey. The project is the work of the Venezuelan artist Carlos Cruz-Diez and takes its inspiration from the dazzle painting of ships which became common towards the end of the First World War. There are a few reasons why Cruz-Diez developed this idea for the Liverpool Biennial 2014. Not surprisingly the original concept for this after the outbreak of war came from contemporary artists at the time. There’s some debate about who actually came up with the original idea, a zoologist, John Graham Kerr, even putting in a bid but the names of Norman Wilkinson and Edward Wadsworth are normally credited with the concept. The Biennial falls in the same year as the hundredth anniversary of the start of the First World War (I’ll never understand the concept of celebrating the beginning of a war that caused such death and destruction) so funding was available from 14-18 Now – WWI Centenary Art Commissions. Finally, Liverpool was one of the ports where much of this dazzle painting of ships took place, even down to the fact that the dry dock in which the Edmund Gardner (the pilot ship that has been revamped) now sits was used during the second half of the war. You tend to hear a lot about such projects long before you see them and I must admit I was a little underwhelmed when I got down to the waterfront to see for myself. First it’s in bright colours – but that’s all right as this is not a reproduction of the scheme used for military purposes but an artistic twist. The problem is the regularity of the use of those colours. It was the irregularity, the uniqueness of the design for each ship, that made the project (which, although never fully proven to be successful in the misnamed ‘Great War’, was used again in Great War Part II) such an innovative one a hundred years ago. Cruz-Diez has chosen a design which has vertical lines of 4 colours (red, green, black and orange – always in that order) on the hull and vertical lines of red, green, yellow and black on the ships superstructure. Apart from being commissioned for the Biennial it is also part of a larger project, Monuments from the Future, which ‘invites artists and architects to bring large-scale imaginary monuments from the future into the present. In order to fulfill this paradoxical task, artists will collaborate with professional futurologists (social scientists who predict possible future scenarios) to determine possible future circumstances and set of events for which a new monument can be imagined and produced. This project will slowly turn Liverpool into a sci-fi sculpture park making use of Liverpool’s industrial archaeology to celebrate its possible new futures.’ So that’s something to look out for on the streets of Liverpool in the coming months. Across the road, in the approach to the Liverpool One shopping complex, the pavement has been painted with similar colours and in a ‘dazzle’ pattern. This is on Thomas Steers Way and is supposed to link the shopping complex with the ship on the other side of the Dock Road. I doubt if one in a hundred of the people who walk along this 100 metres or so of painted walkway have any idea what it’s all about. I was slightly disappointed by Cruz-Diez’s creation as I would have preferred the lines to have been less predictable, more haphazard, more (dare I say it) dazzling. 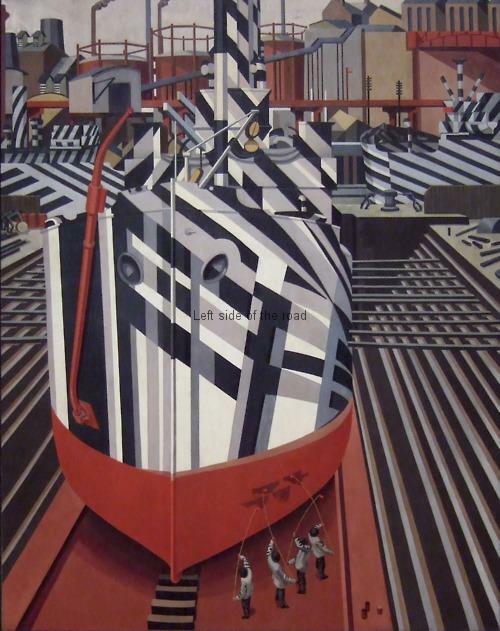 Investigating the background to the whole dazzle ship project at the beginning of the 20th century I saw a photo of Wadsworth’s 1919 painting of men working on a ship in a dry dock in Liverpool. I thought that quite impressive. Anyway, I was glad I went down to the Albert Dock complex to see the work as I then had the opportunity to visit the inside of the pilot ship itself. Being virtually as it was when launched in 1953 it was instructive as an indication of the class structure that existed within the pilot service at the time of its construction but also well into the 1970s. It was eventually taken out of service in April 1981. Although the Biennial ends in October this year the Dazzle Ship will stay as it is until the end of 2015, so there’s no mad rush to have a look. The tours of the ship are run by the Merseyside Maritime Museum. These are free and will take place every Thursday till the end of August at 11.00, 12.30 and 14.30. To avoid disappointment it’s best to book on 0151 478 4499. The Craft of Art is the collective name for a couple of statues by Adrian Jeans which, for the duration of the Liverpool Biennial 2014, will sit in the incongruous setting of the Met Quarter in the centre of the city – a shopping mall full of expensive shops, with products produced by slave labour, to be bought by people who don’t really need them and with money they don’t have. The two statues are called An Allegory of Death and Destruction and An Allegory of Life and Creation and are supposed to represent, through the Chinese/English model and the debris of the Victorian houses on which she stands, the international nature of the city and how it has changed over time. Apart for the colour, one is white the other dark grey, the statues are the same apart from the fact that in her hands the figure holds an AK47 in one and a bunch of weeds in the other. It seems that Jeans is one of those who thinks that the building of shopping centres and the proliferation of cafes, restaurants and bars in what used to be warehouses and banks indicates that the city has stepped out of the decay that it was in during the final decades of the 20th century. But his representation is reactionary in contrasting the two images. If there was one point where national government took in interest in post industrial Liverpool it was after the riots in Liverpool 8 in 1981. Up to that time the Thatcher government (as well as the so-called Labour opposition) had basically written off the city. Why? Because it was prepared to fight. To Thatcher’s chagrin she was forced to allow in injection of money to the city in the form of the Garden Festival of 1984. After two, seven-year periods of EU Objective One money (given only to the poorest parts of Europe and Liverpool was the only one (ever) to have received two bites of that particular cherry) things were still bleak. By the end of the century the fight had gone out of Liverpool as it had in all other parts of the country and now low paid jobs in retail, catering and tourism are considered adequate compensation for the loss of the traditions which the city held for hundreds of years. These are the weeds that the white statue holds in her hands. For the flowers that we look for in a decent future are not gained without struggle and sacrifice, ‘without taking up the AK47’ which Jeans considers only represents death and destruction. However, this sort of debate about contemporary art can only take place when we consider the two statues together. The interpretation of a single piece would lead to an entirely different perception. The statue with the gun, especially as the model is Chinese and wearing a military style cap, would seem to indicate a guerrilla fighter. The one without the gun is just a Chinese woman holding a bunch of weeds. Another point which this installation poses surrounds the ‘Do not touch’ signs. It’s not only here but also in the main centre of this year’s Biennial at the ex-unemployed centre on Hardman Street. One of the things I thought modern, people-centred artists (who are supposed to be those exhibiting at such Biennials) wanted to create a closer connection with the viewer. How is that possible if they literally put their creations on a pedestal and don’t allow any tactile involvement. NB. This installation is part of the Independents Biennial! Some of these artists pretend to be ‘of the people’ but they are merely younger versions of those precious, self-obsessed artists from history. 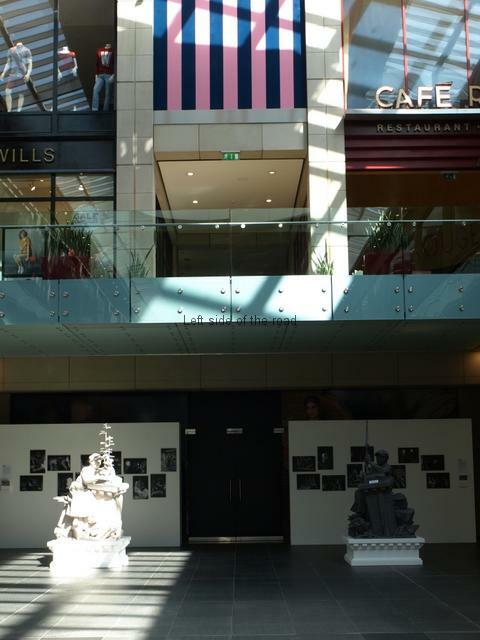 The management of the Met Quarter probably see themselves as patrons of the arts and being magnanimous by allowing the statures space on the ground floor of the mall. However, they couldn’t be any further back and are so ‘out’ of the shopping space that the shops spaces closest to them are empty, whatever businesses might have been there in the past unable to make a go of it – even in the present phantom up-turn in the economy. Nonetheless they are worth going in to have a look. If you do make sure that you look out for the alcove on the left hand side as you go to see The Craft of Art. Here, next to the lifts, is the War Memorial to fallen postal workers that used to sit in the main hall of the Post Office when the building was Liverpool’s main sorting office. This beautiful statue, a young woman with bowed head mourning the dead, is by the Liverpool sculptor George Herbert Tyson Smith. One of his other works is the unique Cenotaph on the St George’s Plateau (where another of the Independents Biennial projects, The Middle Way (the red hand), will be on display). 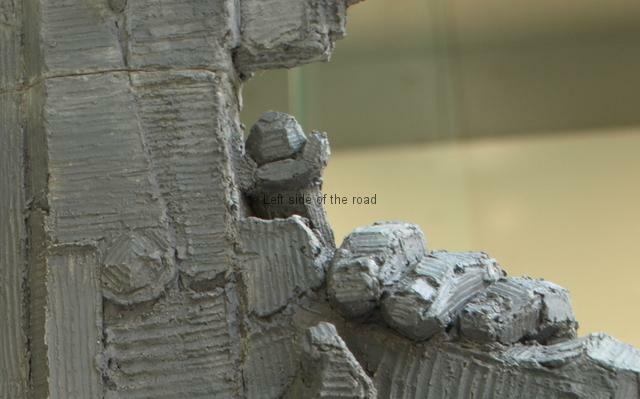 The installation will be in place until 31st August 2014. 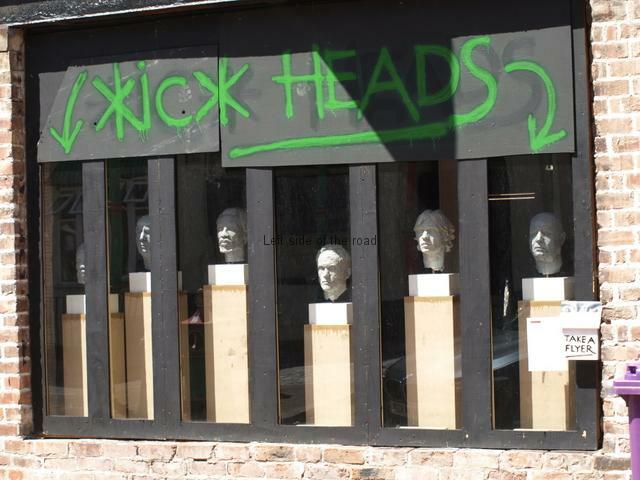 As a companion to the statues in the Met Quarter Jeans also has a display of six heads in a shop window in Nelson Street, the centre of Liverpool’s Chinatown. Once a vibrant street (not too many years ago) any visit here now is a sad affair. Although Jeans argues that Liverpool has been ‘revived’ the corpse looks definitely dead in Chinatown. 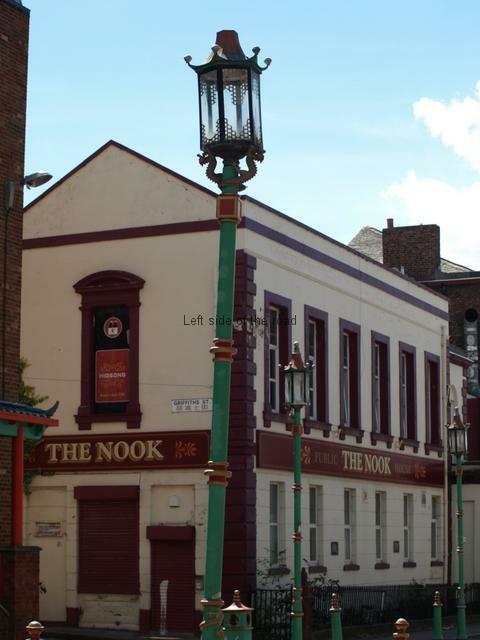 There are more plants growing out of the buildings than are on the street, the largest Chinese arch in the world outside China looks incongruous next to the Blackie and the once fascinating pub, the Nook, has been closed down for years. One of the most interesting aspects of the earlier biennials was the fact that art was taken to the people in the sense that there were many installations out on the streets, away from the traditional art galleries, in an attempt to attract the people who were not used to going to art exhibitions. Even in a country where most (although sadly not all) exhibitions are free to enter only a small percentage of the population will take advantage of these opportunities as a matter of course. In this sense the appreciation (or otherwise) of art is still an ‘elite’ activity in Britain. And this is even more so when contemporary art is concerned. This attitude is demonstrated every year with the announcement of the short list for the Turner Prize. Somewhat younger people might say Tracey Emin’s unmade bed, My bed, that was first exhibited at the end of the 90s and which has just this very month been sold by the Thatcherite Charles Saatchi for £2.2 million. Nice work if you can get it, no? Even younger people might say it was a computer game, but there they lose me. Each time there’s a media storm about such a piece of art it has the effect of putting ordinary, non-professional people off ever entering a gallery. Instead of a positive reaction that would say ‘this is unacceptable we need art that is relevant to our everyday lives’ just the opposite happens. The elite, in terms of artists and critics, maintain their control of the artistic expression of the country. In the process it’s forgotten how modern, contemporary art IS part of everyday life and this is especially in the field of left-wing politics. An example of this would be the trade union banners created in the 19th century onwards to the home-made, individual placards that were carried through the streets in demonstrations against the illegal Iraq war and will be carried in the streets this weekend against the murderous Zionist invasion and the continued persecution of the Palestinian people. There was a very good exhibition of such work at the Tate Liverpool at the beginning of this year. Art turning left: How values changed making, 1789-2013 displayed artefacts that were, in may cases, working pieces of art. They were created for a purpose, to argue a case, to promote an ideology, as pieces of propaganda (a word which has been given a negative connotation merely in order to try to castigate the left and socialist movements – obviously capitalism doesn’t stoop so low as to use ‘propaganda’). However good this exhibition was, in my estimation, it was not hugely well attended. And that comes from the demonisation of contemporary art over the years and the alienation of the vast majority of people from such ideas. That’s why the early days of the Liverpool Biennial were interesting and challenging. It sought to bring art to the people (a phrase that can sometime sound, and be, pretentious) by literally taking the art to the streets. As time has passed, however, (this is now the eighth Biennial) there seems to be less of that approach. The Independents Biennial might be in smaller locations not recognised as conventional galleries, many of them cafés or bars, they are still inside, it is still necessary for people to enter an environment they perhaps are not used to rather than just turning a corner and bumping into something, strange, out-of-place and hopefully thought-provoking. Although this is the idea written about in the Independents Biennial Events Guide there seems to be less of such work than in previous years. It will be interesting to see if my perception changes over the course of the next couple of months or so and any ideas will be added to this post. One installation that follows the tradition of placing art in those places where people don’t normally go for the enrichment of the soul (but rather to worship at the feet of Mammon, spend money they don’t have and participate in the ludicrous, ridiculous and obscene practice of ‘retail therapy’) is The Craft of Art, two statues in the Met Quarter, the shopping mall in Whitechapel, in the centre of town.